'360 video' is term that's soon going to be synonymous with 2016, as Virtual Reality (VR) is all set to take off. It's probably still premature to say it will go mainstream this soon but the bigwigs of the tech world are trying to create enough buzz to at least make people aware of the existence of such devices. One way to fast-track VR adoption is by making the consumer the content creator, which is where devices like the Ricoh Theta S come in. We saw numerous new 360-degree cameras launch at this year's CES from big names like Nikon and Kodak . A similar trend was also in effect at Mobile World Congress last month, where Samsung announced the Gear 360 and LG unveiled its own 360 Cam. 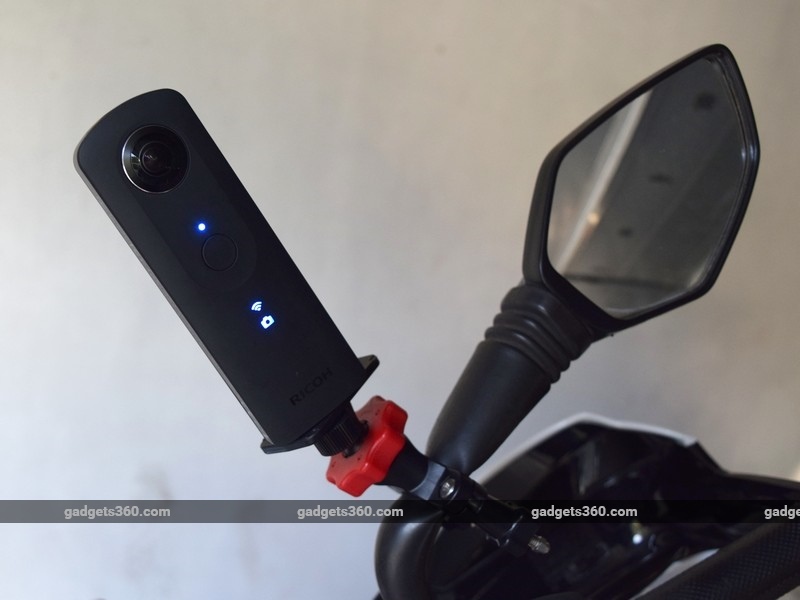 Jumping back to the product of the hour, the Ricoh Theta S launched in India last November. The company has been dabbling in 360-degree cameras for a while now, even though not many might associate the company with this. The Theta S is the latest iteration in the series, and it doubles onboard storage and adds live streaming into the mix. The candybar shape and size makes the Theta S very easy to pocket. It measures 130mm in height and weighs about 125g. The plastic body feels like it could take a knock or two if you accidentally drop it, and the rubberised coating makes it easy to grip even with wet fingers. In the centre, we have a large shutter release button which can take a picture or begin recording a video. There are LEDs for power, Wi-Fi, and shooting mode hidden beneath the rubber coating, and are visible only when lit up. On the right, we have buttons for power, Wi-Fi, and toggling between stills and video. The microphone is placed on the top. On the bottom, there's a Micro-USB port for charging and transferring data, a tripod mount, and a Mini-HDMI connector. The latter is used for live streaming when you connect the Theta S to a computer. The Theta S is fairly compact and well-built, making it super easy to carry around. It also feels durable, and the rubberised coating should give some resistance against the elements of nature, even though the device is not officially described as weatherproof. At the heart of the Theta S are two 1/2.3-inch 12-megapixel CMOS cameras with f/2.0 apertures. Each has a fish-eye lens which captures a 180-degree view. Data from both sensors is then stitched together within the camera to give you a 360-degree image or video. The camera supports up to 25 minutes of continuous shooting at 1080p at 30fps. The onboard storage is 8GB out of which 7.5GB is actually usable. Sadly, there's no way to expand the storage. The new model also adds HD live streaming but the feature is still somewhat a work in progress. You can capture a live video feed from the two cameras using software like VLC or Media Player Classic: Home Cinema. The idea is to allow the operator to be in control of the perspective as you stream a feed to any audience. With its current firmware, the Theta S will display the two feeds as orbs, side-by-side, which isn't of much use. We are told that a future update will improve this. 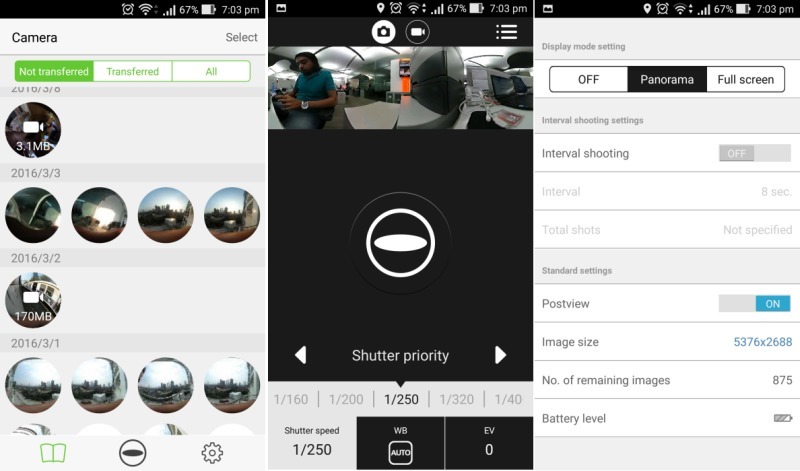 Shooting modes and options can be found in the Theta S app for Android and iOS. Here, you can copy or move files from the Theta to your smartphone, use its display as a viewfinder to frame your shots, and configure Facebook and Twitter accounts for instant sharing. The app gives you manual controls for shutter speed, white balance, and exposure level for stills, while the video tab lets you toggle between HD and full-HD resolutions. You also have the option for time-lapse photography. The iOS app lets you blur out portions of an image that are skewed, typically your fingers, if you happen to be holding the Theta S in your hand when shooting. This is something that's missing in the Android app. Images and video can be edited in separate apps called Theta+ and Theta+ Video, with the latter being exclusive to iOS. Taking a 360-degree photo or video is as simple as hitting the big shutter button. The quality of images and video is pretty impressive too. Pictures have a good amount of detail in daylight and under artificial light. Low-light images are not too shabby either but the picture tends to get a bit grainy. Video also fares pretty well under most lighting conditions. You can take a look at the sample pictures and video to see what we're talking about. Our video sample appears a bit shaky mostly due to the fact that the mount we had it on was meant for a bicycle and not a motorbike. Ricoh has a selection of mounts which can be purchased separately. The big question that you're probably asking yourself is how all of this can be seen by others. After all, there's no point in capturing all this cool footage if you can't show it off. Sharing stills is a lot easier than videos. You can open 360-degree images with any photo viewer, as they are saved as JPEGs. However, the images will appear warped since you're viewing a spherical image in one dimension. The best way to view them is with Ricoh's app for mobiles and desktops (PC and Mac). 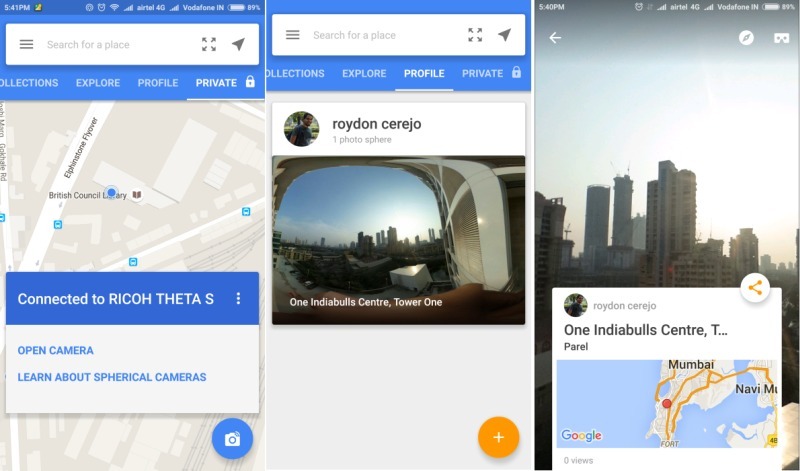 You can also upload images to Google Photos, which will recognise them as Photo Spheres. Images can also be uploaded to theta360.com directly from your phone, and anyone with the link can see the spherical image online. If you share the link to Facebook or Twitter, users will be directed to the theta360 website. You can choose to make images public or private. The Theta S also officially supports Google Street View, which means you can upload 360-degree photos directly to Google Maps. It works well and is simple enough to use. Sharing videos involves a slightly more convoluted process and this is something Ricoh says it is working on simplifying. Videos are shot in mp4 format and play just fine on the smartphone app as soon as you copy them over from the camera. Unlike photos, you can't directly upload videos to YouTube360, Facebook, or even the theta360 website - they have to be converted first. This is where the convoluted part comes in. All videos must pass through Ricoh's desktop application before they can be uploaded to any platform. The converted videos have a slightly altered height and the bitrate is nearly halved in order to reduce file size, though quality doesn't seem to be affected too much. 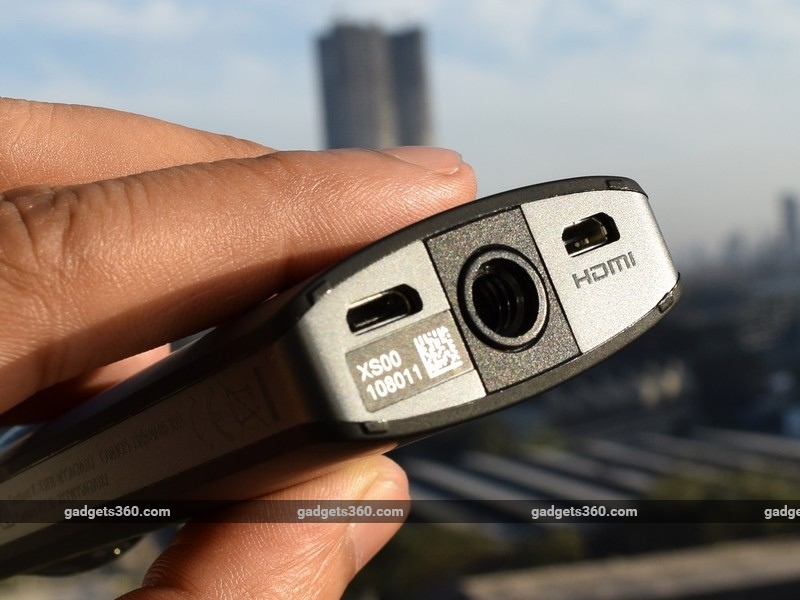 A 15 minute video recorded at full-HD resolution will occupy a little more than 1GB of space. Once converted using Ricoh's desktop app, you can upload the video to theta360.com (file size is limited to 4.5MB currently), YouTube or Facebook, where it's recognised properly. YouTube's compression tends to hamper the quality of the video a bit but that hopefully should get better with time. The Theta S gets warm very quickly when recording video or transferring files to a smartphone. Both these tasks take a fair bit out of the battery life as well. 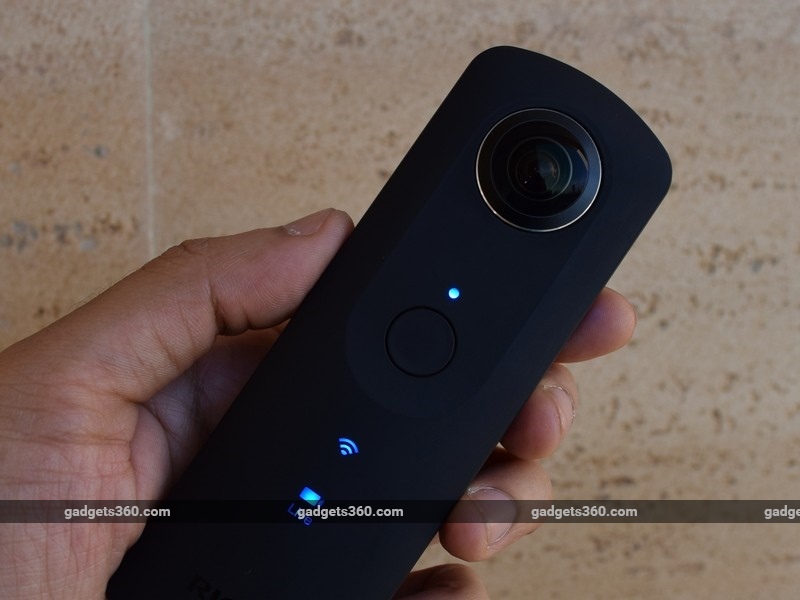 Ricoh says the Theta S is good for about 260 photos but this will vary wildly depending on how you use it. 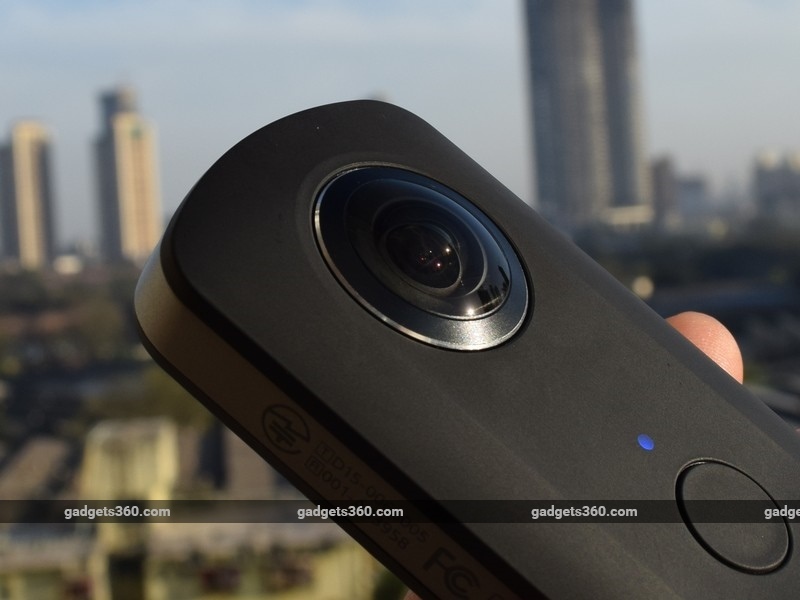 The Ricoh Theta S is one of the few (if not the only) 360-degree cameras available in the country right now, and it comes at an understandable premium. Rs. 39,000 is a lot of money for a device that is essentially a one-trick pony, but to give credit where it's due, it's one of the coolest tricks we've seen in a long time. The process of sharing video is a bit convoluted right now and we wish the camera had more storage or at least the option to add more. Apart from that, the Theta S delivers as promised. It's very well built, small, and almost inconspicuous. It takes good quality stills and video with a 360-degree field of view. The live streaming feature will also be interesting to use once the kinks are worked out. We expect to see many more devices like the Theta S in the market soon, and with them, hopefully a healthy reduction in prices too. Now, with Samsung and LG aggressively backing VR, we hope to see some level of standardisation in this segment so content can be viewed and shared, unaltered, across devices and platforms.